If you are a frequent air traveler, by not having one or more of the best airline credit cards you can be missing out on free air travel or other reward opportunities. The advantages of having airline credit cards include getting airline spending bonuses, elite status spending bonuses, reduced mileage awards, priority boarding, priority award space, mileage refunds, anniversary mileage bonuses, and free checked bags. It is almost impossible to mention a single travel or airline credit card as the best because different cards are best for various types of travelers and purposes. For example, some are better for flight-only rewards, while others are better for hotel-only. Having one or more of the following airline credit cards, you can avail most of the advantages mentioned above. Below are six cards well worth your consideration. Barclaycard Arrival Plus World Elite MasterCard offers a lot of benefits for just $89 annual fee after the first year (the first year is free). It is the best fit for someone who does not want to fly on any particular airline. It is also good for anyone who travels internationally and wants to have higher reward rates. 2 miles for every $1 spent on anything be it travel or food or anything. 50,000 miles sign up bonus if you spend $3,000 within the first three months of getting signed up for the card. Your miles never expire as long as you have your account active and open. 0 percent on balance transfer for the first year. No foreign transaction fee like most other cards. You can 5 percent miles back every time you redeem your rewards. Not a good idea for someone who spends less than $4,200 per year on travel credit cards. Not the best for someone who wants to transfer reward points or miles to other loyalty programs. With absolutely no annual fee, BankAmericard Travel Rewards Credit Card is another attractive option for air travelers. It is a great fit for international travelers. BankAmericard Travel Rewards Credit Card is not recommended for a traveler who does not own a Bank Of America bank account. The chance for higher reward rates if you already have a Bank of America account. Based on the average balance you maintain in your Bank of America account, you will get increased reward rate. If you maintain an average $50k plus the balance in your account, your bonus rates will climb to 2.25 percent to 2.625 percent. This amount is significantly higher than all other travel credit cards. EMV chip and absolutely no transaction fees make the card perfect for international travelers. Just 1.5 for non-account holders is lower than most other airline credit cards. One of the best airline credit cards available right now is the Chase Sapphire Preferred Card. While its annual fee is $95, the first year is fully waived for the card holder. Having a Chase Sapphire Preferred Card is good for foreign travel, to big sign up bonus and flexible rewards. Unlike most airline cards, you can use the Chase Sapphire Preferred Card in numerous ways such as to earn 2 points for every $1 spent on travel and restaurant dining and 1 point for every $ spent on other things. When you use Chase Sapphire Preferred Card to book your trips, your rewards points will worth 25 percent more. In other words, cardholders get 20 percent discount when they book their flights using their Chase Sapphire Preferred Card. You can also transfer Chase Sapphire Preferred Card reward points for 1:1 to more than ten other frequent flyer and hotel loyalty programs including Virgin Atlantic, British Airways, Southwest Airways and United Airways. You get 50k bonus points spending $4,000 within first three months of getting the card. Not the best when you use a single airline most of the time as having a co-branded credit card from your preferred airline will be most advantageous. Issued through Barclaycard, Lufthansa’s US-branded credit card comes with a sizeable sign-up bonus with new cardholders being eligible for up to 50,000 bonus points. Cardholders can get up to $500 worth of bonus miles. If you are someone who flies to and from Europe quite frequently, the Lufthansa Premier Miles & More MasterCard is a perfect option. The card has a $79 yearly fee. This card is mostly recommended for someone who uses Lufthansa business class quite frequently, especially to and from Europe. The biggest advantage of Miles and More card is the companion ticket or pass. The cardholder will qualify for the companion ticket after the first purchase annually and after that. 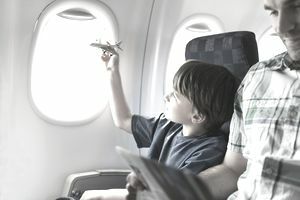 Cardholders get two award miles per $1 spent on air ticket purchases using Miles And More Card. Again, cardholders get one award point for each $1 devoted to non-ticket purchases. After spending $500 or more within the first three months of signing up for the cards, the cardholder gets 30,000 award miles as a bonus. In addition to using the card for flights and upgrades on Lufthansa, the holder can use his or her reward points in other airlines including SWISS Airlines, Brussels Airlines, Austrian Airlines, and all other Star Alliance flights. $5,000 spending within three months might be a little too much for many to get the 30,000 award miles. Not best for flying to and from other continents other than Europe. Southwest Rapid Rewards® Plus Credit Card might not be the most popular airline credit card out there, but it is best for people who spend less than $10k on their cards in domestic travels. The card has a $69 annual fee. Cardholders earn 40,000 reward points spending just $1,000 within the first 90 days. No other airline credit card offers this excellent signup deal. 2 points on every $1 spent on Southeast and all its participating hotels and car rentals. And 1 point on other purchases. 3,000 reward points after anniversary every year. a 3 percent fee for every purchase for international travel is onerous and one of the top reasons many people who travel internationally do like this card. Because Southwest is not a member of any of the three major alliances, there is no way to combine points with trips taken on other airlines. Having a JetBlue Plus Card can be a good deal for travelers who spend at least $920 on JetBlue flights annually. It comes with some likable benefits, but $99 annual fee is one of the highest among all airline credit cards. Just like Southwest Rapid Rewards® Plus Credit Card, JetBlue Plus Card offers 30,000 reward points if the cardholder spends at least $1,000 within first 90 days of signing up. You earn 6 points on every $1 spent on JetBlue flights. You also earn 2 points per $1 spent on grocery and 1 point per $1 devoted to other things. There are several airline credit cards available. While all are not good, most cards offer some advances for a particular class of traveler. Chase Sapphire Preferred Card is best for getting most rewards and flexible redemption. JetBlue Plus Card is a good option if you frequently fly on JetBlue flights. Southwest Rapid Rewards Plus Credit Card is good for the savvy domestic traveler. Lufthansa Premier Miles & More MasterCard is best for people who frequently travel from and to Europe. BankAmericard Travel Rewards Credit Card is best for frequent international travelers. Barclaycard Arrival Plus World Elite MasterCard is best for travelers who is very loyal to a single airline. Armed with this information and an understanding of your travel habits, you are in a position to choose the card that is best for your needs.